Are you ready for a big adventure? You need to back away from the buffet, stop feeding the slot machines, and, for goodness’ sake, put on a pair of pants. You didn’t come all the way to Alaska just to eat, gamble, and run between pools. You could have done that much closer to home. Your cruise ship is sailing up the Gastineau Channel. Juneau is already in sight. And it’s almost time for you to hike to a glacier. Mendenhall Glacier sits just 12 miles north of Juneau. Its blue and white ice looks like its glowing as you approach it. The glacier is currently about 13.6 miles long. It’s been retreating as average yearly temperatures increase. That’s right, global warming. About 1.75 miles of it has disappeared since 1929, when Mendenhall Lake was created at its current base. The Juneau Icefield Research Program has been watching it slowly disappear since 1942. It’s only a matter of time until you won’t be able to see it from the visitor center, the first one created by the United States Forest Service. This glacier, as well as nearly 130 others, are all part of Tongass National Forest. The largest national forest in the United States—it covers about 17 million acres—lies in Southeast Alaska along the border of British Columbia. Theodore Roosevelt first established the Alexander Archipelago Forest Reserve in 1902; Tongass National Forest followed in 1907. One year later, the two forests were combined to protect the largest remaining temperate rainforest in the world. The Coast Mountains, fjords, glaciers, and rare flora and fauna were included, as well. Juneau is even part of the national forest. There are no roads connecting Alaska’s capital to the rest of the state. No wonder it’s arguably the most scenic state capital in the country. But enough about the rest of the forest. The glacier is your focus right now. Numerous trails begin near the visitor center. 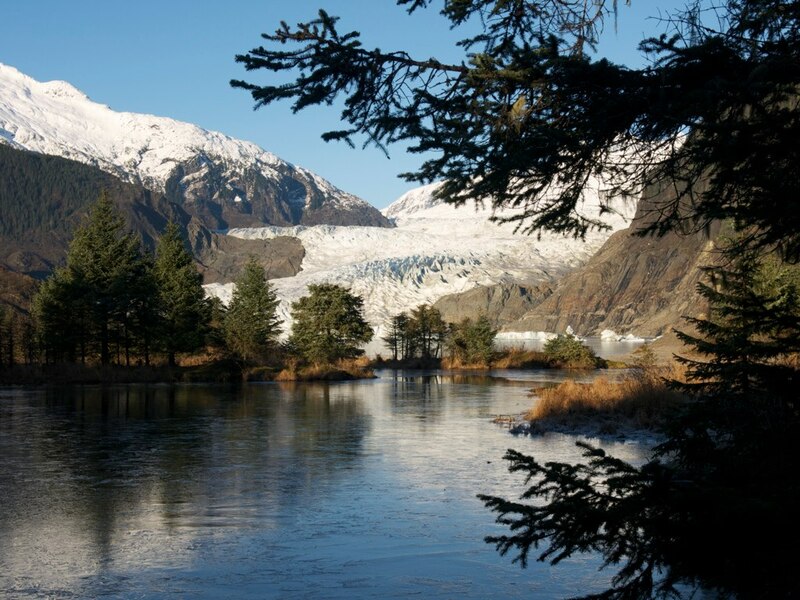 The short Photo Point Trail offers the best panoramic view of the glacier. Off that, the Nugget Falls Trail leads to a two-tiered waterfall that flows into Mendenhall Lake. While black bears are often spotted feeding on spawning sockeye salmon from the Steep Creek Trail. Your sights are set on the West Glacier Trail, though. It’s longer (seven miles roundtrip), farther away (the trailhead begins on a different road), and more difficult (crossing bridges, slippery rocks, and switchbacks). But it brings you right up to the glacier. You can walk on the ice at the base, cross ever-widening crevasses, and explore the deep ice caves. These, not the cruise ship’s amenities, are the reasons you really traveled to Alaska.